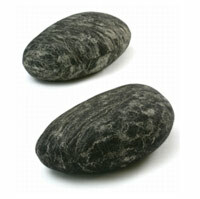 check out these cool pebble seats made by Estonian designer, Annike Kelaigo. Looks like stone, eh? No sir. It is a handmade felt in wood/flax stuffed with recycled wool. The big one is 65 x 90 x 30cm. The small one is 55 x 75 x30 cm. Anni’s website is flash-based so i can’t give a direct link to the page, but just hit the “products” link and click on “Kivi / Pebble”. The product, “Oh! This is me!” is pretty nice too.